If I made this for a larger group of people, I could have used a whole can of paste, but since it was only for we two, I was happy to find this tube of San Marzano paste available at Whole Foods. And I love the box design; it’s so pop art. I wanted fresh pasta, but Whole Foods selection didn’t wow me, but these super-long Pre-Raphaelite noodle tresses sure did. The final ingredient should have been locatelli cheese, which is a type of Pecorino Romano, although a bit more rubbery. I chose this nice aged Asiago instead – it will be shredded generously on top of the pasta right before service. I start by mincing my garlic and finely chopping my onion and shallot. Next, I start with my EVOO, which I set into my saucepan over high to get nice and hot. In go my aromatics, which I let soften in the hot oil, stirring well, for about 5 minutes. In goes my black pepper and my red pepper flakes. Something about living in Syracuse strengthened the lining of my stomach, because there – unlike any other time and place in my life – I was able to eat seriously spicy food. Since I’ve moved to Boston, tho, I just can’t handle too much capsicum – woe is me. So I started with only about a teaspoon of red pepper flakes, adding more throughout the entire cooking process until I reached my limit. For you, dear reader, I recommend you hop it up all you like; the recipe is titled, after all, “Hot Tomato Oil” – pansies like me notwithstanding. It’s time to add the tomato component to my hot tomato oil: I start with a few tablespoons of my condensed paste, which I add to the pan and stir in well. Next comes the roma tomatoes, which I’ve fished out of the can. I don’t need the whole 17oz, so I only grab about 4 of them. These I squish and break into the simmering oniongarlicspicyoil. Finally, I add a few healthy dashes of paprika, which will promote the lovely red color I want, and about 2 tablespoons of suce, which will both balance and add more complexity to the sauce. Setting my heat to low, I now allow this lovely sauce to simmer for the next 15-20 minutes or so,while I prep my pasta. The sauce will not overcook, but I do recommend stirring it from time to time. The tomatoes and veg will shrink up into little chunky bits, and although the oil separates — which it should — it will be very tomatoey flavored, with a wonderful sweetness at first taste, and a lasting heat kick at the finish. Whole Foods also has a fantastic antipasto bar, and these cool segmented trays into which you can put exactly what you want. I grabbed items in equal numbers: 6 peppered olives, 12 oil cured black olives, 1 large roasted pepper I could cut later, several gherkins, a couple of caperberries, some marinated artichoke hearts, 2 peperoncini, and one little sweet peppadew, which I eventually quartered and stuffed with goat cheese. All this savory goodness was layered over some EVOO dressed chopped lettuce and topped with some small fresh mozzarella and balsamic vinegar. I set this platter on the table between us, so we could dive in together while we enjoyed our pasta. Speaking of pasta, my long cool corkscrew curled noodles are perfectly cooked – just a little al dente – and ready to be sauced. 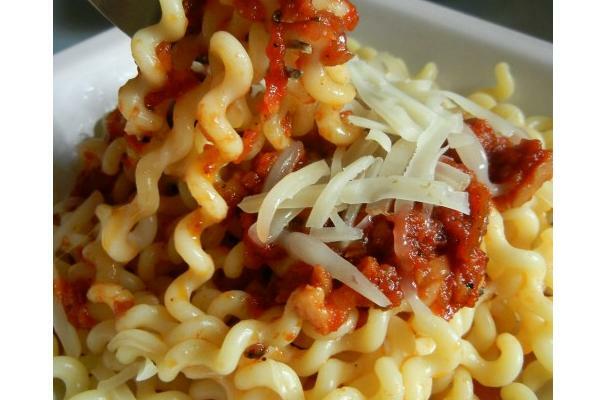 Tender tendrils of pasta swim in spicy red oil and rich chunky tomatoes, and are topped with an abundance of shredded asiago cheese. It’s served alongside my fresh antipasto, a perfect cold accompaniment of meats, cheeses, and sharp vegetables – just right to offset the heat from the peppers and paprika in my pasta sauce. All in all, this meal took about 40 minutes to prepare – and about 15 minutes to scarf down with total abandon. A super-satisfying, simple and elegant dinner for any occasion; thanks, Pastabilities, for the inspiration!